A spectacular, modern, impressively designed luxury seafront villa, nestled in the peaceful and quiet bay of Sumartin, on the island of Brac. It offers 4 luxurious ensuite bedrooms, a beautiful stone terrace with infinity swimming pool and fabulous views over the bay of Sumartin and the Biokovo mountain range. It is a perfect mixture of traditional and contemporary. Villa Premium Brac spreads over three levels and it is an outstanding example of modern Dalmatian architecture. It has been elegantly designed with care, using only the best materials, from the fine Brac white stone on the outside, to beautiful fabrics, modern furnishings, crystal chandeliers and the finest materials in its interior. This five-star villa was built as a family holiday home with large and unbelievably full of light and airy rooms, opening on to spacious, partly shaded terraces, conveniently furnished and very well equipped for outdoor living. Villa Premium Brac is fully staffed with a housemaid and manager, giving its guests opportunity and enough time to completely unwind and enjoy their vacation to the fullest. Four elegant and stylishly decorated en-suite bedrooms open out onto terraces with sea view and offer accommodation for 8 persons and all bedrooms are air-conditioned. The stylish kitchen with views over the bay is fully equipped and extends to the spacious living room with floor to ceiling windows. In the outside area, guests can enjoy the magnificent infinity pool with stunning views of the peaceful bay and its crystal clear sea. Surrounding the swimming pool there are plenty of sun loungers for guests to enjoy a lazy day in the sun or an evening cocktail. In the outdoor dining area, there is a table for 8 persons and also a barbecue. The luxury seafront pool villa in the quiet bay of Sumartin, Brac also features a gym, sauna, steam room, media room, private pier for boat mooring and a wine cellar. 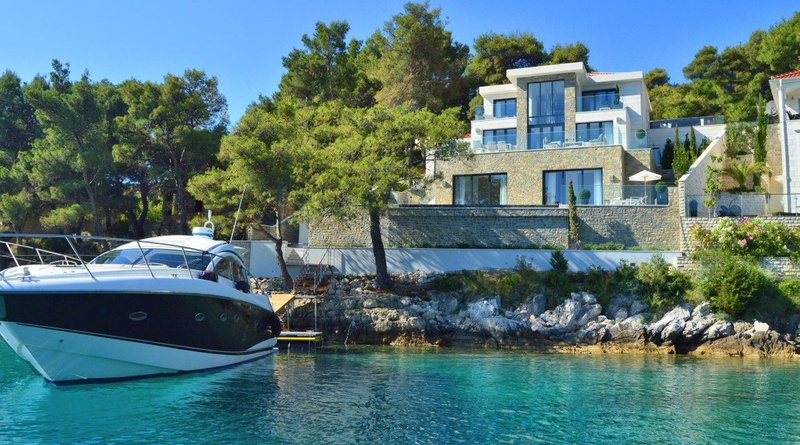 Villa Premium Brac is an ideal starting point for exploring the beaches and islands of the Dalmatian coast. There are a few small beaches within the bay itself with many more in nearby coves. In front of the villa, guests have a private mooring for a boat. 2 x Double bedrooms with ensuite bathrooms and access to a private terrace. 2 x Master bedrooms with ensuite bathroom and access to private balconies.